Life on our mountain might be like a box of chocolates, but at Lake Champlain Chocolates, 2you know what you’re going to get. And, in case you haven’t put milk and cocoa together by now, that’s some really good chocolate. The chocolate factory and retail store is located in Burlington VT, about 10 minutes from ECHO, the Leahy Center for Lake Champlain, a lovely aquarium and science center. Known for the sweetest tour in town, the place was packed. Lake Champlain Chocolates has been crafting specialty chocolates in Vermont for more than 30 years. The truffles are especially popular. 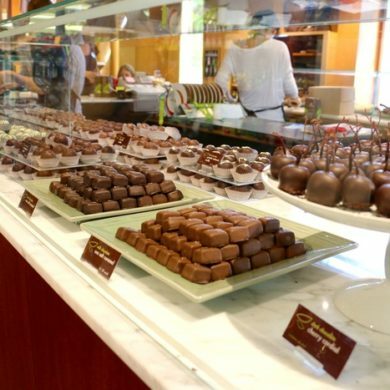 To witness the chocolate magic, tours begin every hour on the hour, from 10 a.m. to 2 p.m. daily. Self-guided tours are available after 3 p.m.
Workers at Lake Champlain Chocolates start each day around 6 a.m., wrapping up by 3 p.m, possibly after they literally ‘wrap up’ some chocolates. Next door to the factory is a restaurant and education kitchen called the South End Kitchen. It has indoor and outdoor seating and serves simple, seasonal fare for lunch, dinner and dessert. Everything coming out of the kitchen looks and smells amazing. If you’re here for your ‘just desserts,’ check out the coffee bar, offering milkshakes, homemade ice cream and sundaes. The education kitchen also hosts chocolate bar making classes, should you have the time in your schedule. This location is home to Blue Bandana, an award-winning line of single-origin craft chocolate bars by Eric Lampman, head of research and development at Lake Champlain Chocolates. He’s also the son of founder Jim Lampman. What’s special about Blue Bandana Chocolate Maker? These micro-batch chocolate bars are produced in Vermont using cocoa beans sourced directly, so they go straight from bean to bar. Dark and rich, the 70% Madagascar Dark Chocolate Bar and 70% Madagascar Wild Pepper Dark Chocolate Bar were named among the winners of the 2014 Good Food Awards. So, head to Lake Champlain Chocolates to get yourself some good food. Lake Champlain Chocolates is located at 750 Pine Street in Burlington VT. You can order the all-natural chocolates online. For more information, visit the Lake Champlain Chocolates website or call (800) 465-5909.